First of all, why would anyone want to cancel Private Registration after paying for it? I’m looking to consolidate my domains to one domain name registrar, mainly just to keep things simple so I can focus on my blogging, as I love blogging. I have chosen Hover (you can read more about why I like Hover here), as they include WhoIS privacy for free (something I paid GoDaddy for a few years back). 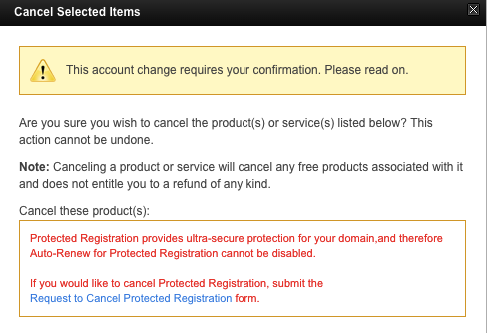 What happens when you cancel GoDaddy Private Registration? How you cancel Private Registration will depend on how many domains you currently have in your account. Now, if only that was it and I could easily cancel my private registration. You actually need to make sure you have certain documents to confirm your business registration before being able to cancel your GoDaddy Private Registration. It’s understandable to have your Government ID, but it’s not everyone is going to have their online domain name registered as a business – so that’s where I am stuck right now. From GoDaddy – “The Protected Registration service must be cancelled by submitting the online request form and providing the required documentation. Because of the services this protection provides, there is no option to turn off the auto-renewal”. A copy of your Government ID – be that a passport or something similar (see their instructions in the screenshot below). A copy of business documentation for the company listed as current registrant – Again, I’m stuck on this step, but once you are able to provide this, you will be able to remove the Private Registration. What exactly did GoDaddy ask me to give? To be clear, here are the documents that GoDaddy asked me to give from their team at protectedreg(at)godaddy.com. 1. A clear, readable copy of the government-issued photo identification in which the pictured person, name, signature, and expiration date are clearly identifiable. The copy of the government-issued photo identification we received is expired. You can feel free to block out information such as the date of birth, height, weight, eye color and the license number. 2. A copy of business documentation for the company listed as current registrant. *For U.S Based businesses – We can accept an EIN/TIN Assignment Letter from the IRS. You may request a copy of this letter by contacting the IRS at 1-800-829-4933. **Note: We cannot accept copies of articles of incorporation/organization, applications, and documents printed from the internet or tax returns as business identification. Once this is received we will inform you of what is needed to process your request or we will let you know that your request has been completed.